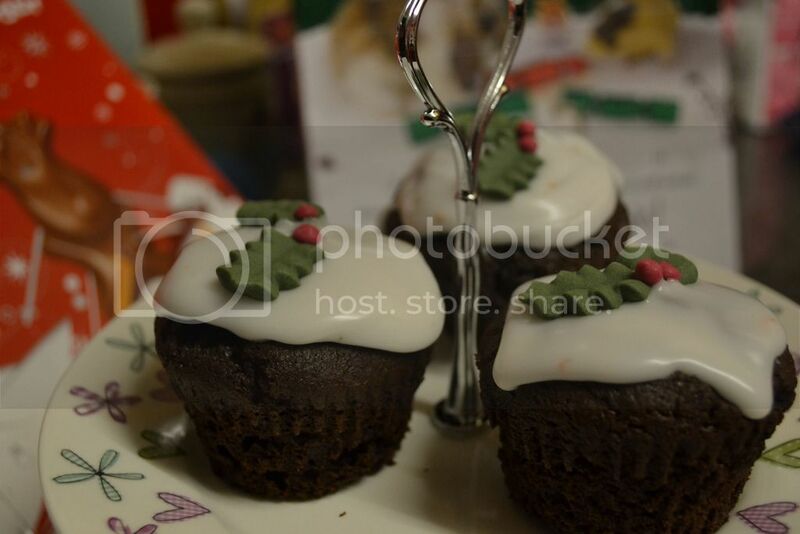 Blogmas wouldn't be Blogmas without throwing in a baking post now would it? 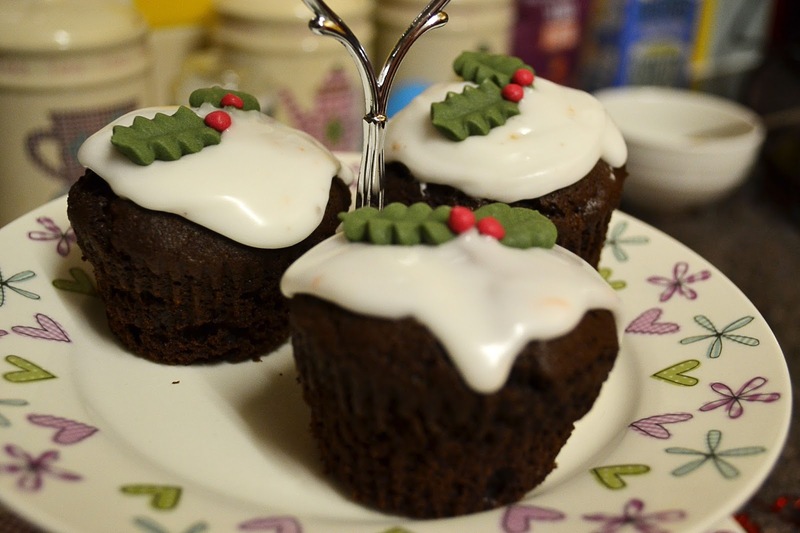 I spent hours browsing Pinterest looking for some Christmas inspired recipes but then it struck me, Christmas pudding cupcakes! I saw pictures of them and thought they were so adorable, I had to get stuck in and make some asap. For the cakes I followed an easy chocolate cupcake recipe but added in my own little extras according to what I had in my cupboards. My baking cupboard is like a gold mine honestly, holding all sorts of hidden treasures! Method 1. Preheat the oven to 190c/Fan 170c/Gas Mark 5. Melt the chocolate and butter in a bowl together over a low heat, let it cool then stir in the eggs. 2. Mix the flour, sugar, cocoa and baking powder in a bowl and stir in the chocolate mixture until smooth. Add the dried fruit and cherries and stir. 3. Spoon the mixture into muffin cases and put in the oven for 20 minutes. 4. Once the cupcakes have cooled, pour icing sugar into a bowl, add a tiny amount of water and mix until your icing is the consistency you'd like. Apply to cakes and decorate. Are they not the cutest cupcakes you have ever set eyes on? I feel like a proud mother. Although they do contain dried fruit, they're a fab alternative for an actual Christmas pudding but that's what I love about baking. You can put in and leave out whatever ingredients you want, this recipe could essentially be used for some simple lil' chocolate cupcakes and they'd still be incredibly yummy! If you do have a go at making these, I'd love to see them. Other than that - see you on Monday for another Blogmas post! Oh my, these look too good to eat! I'm so impressed with your decorating skills too, so cute! I am drooling! They look amazing and now I want to bake so badly. They are the CUTEST! I'm going to run off and make some right now! These look incredible. I'm not a fan of Christmas Pudding but this recipe sounds delicious, I'll have to give these a go! Also I spy Merryteasers in the background.. yum. Ooh thank you, I feel honoured haha! 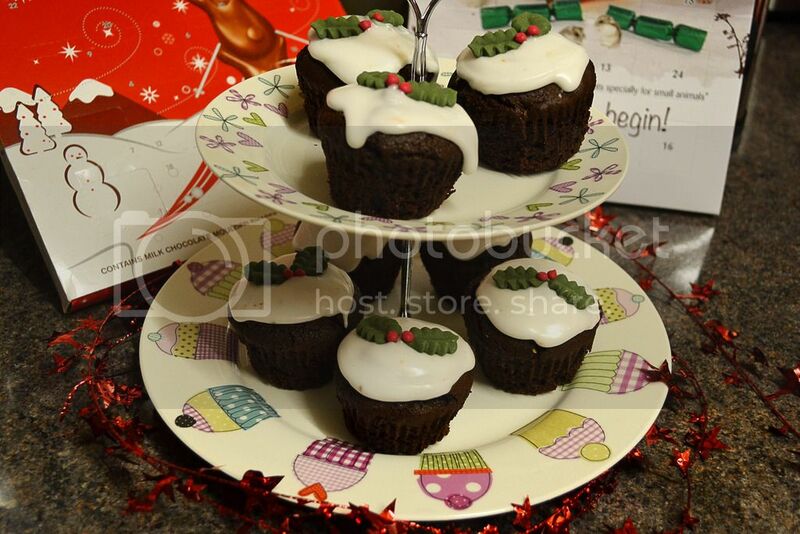 Who can say no to a chocolate cupcake, especially if they are decorated so nicely. Okay these look sooooo good!! First of all, what an awesome job you did with that header hon! :) I LOVE it! It's super cute! Girlie, you got me at hello, those cupcakes are the cutest & the recipe sounds soooo good!! Thanks lovely, you should definitely add a lil Christmas spirit to your blog! p.s I just discovered your blog and I'm already lovinin' it. Can't wait to read more! I totally understand haha, they are pretty darn cute if I do say so myself! Oh these look sooo cute! And tasty... I may just make some of these for Christmas day. My little cousin would love them! Kattttt ughhhhhhh these look DELICIOUS. I'm salivating so much. I can't bake at all but you've got permission to pop over and bake for me? Of course, I'll be your own Mary Berry! Oh these are the cutest! I wish I could taste one haha!!! They're rather tasty, not gonna lie! I made it on Photoshop! It was surprisingly easy once I got the hang of it haha. Oh my GOSH there actually are some left for you! Want to make these bad boys as soon as possible. They sound & look gorgeous!